To the Land of Wonders- Egypt - 21st Jan onwards (Last 2 Slots Left)!! 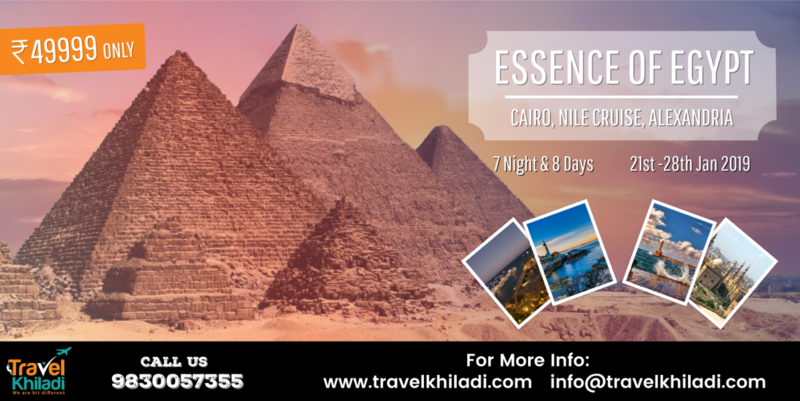 We all have a dream to visit 7 Wonders of the world and this is the best chance to go for this trip with like minded travelers. We always plan cost effective trip with no compromise on Quality. Also there is a Female tour leader in this trip so Girls night out is there. We have only 2 Seats left now....! We are applying for Visa post 25th Dec. Follow us on https://www.facebook.com/travelkhiladi/ and instagram. Best part about this trip is that, 40% travelers are those who already traveled with us in the past, so new folks can understand that they are Happy with us to go again n again. Our trip​ ​gives you the chance to explore and to discover the culture, history, beautiful scenery, meet friendly local people and enjoy photography at this beautiful location. 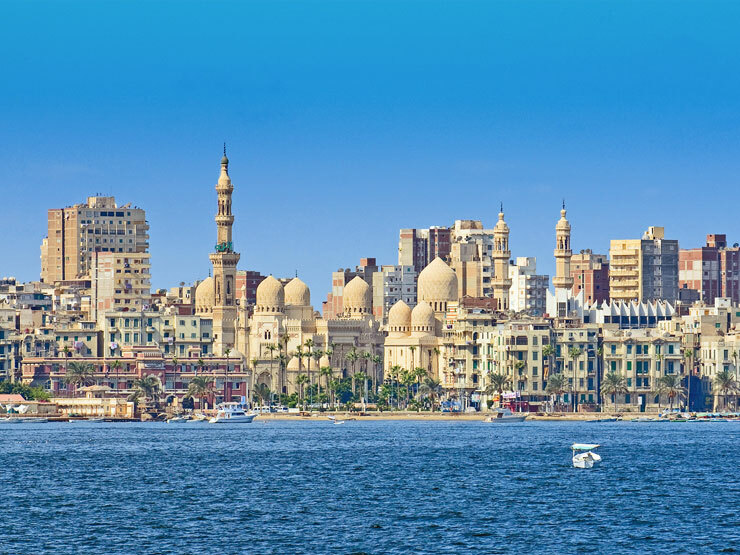 Sail through the River Nile with Amazing 5* Cruise, make new friends and dive into history once again. You can check out ITINERARY given below. Welcome to your tour! On arrival at Cairo, your representative greets you at the ‘meeting point’ at the exit after immigration and customs and transfers you comfortably to your hotel check-in hotel. 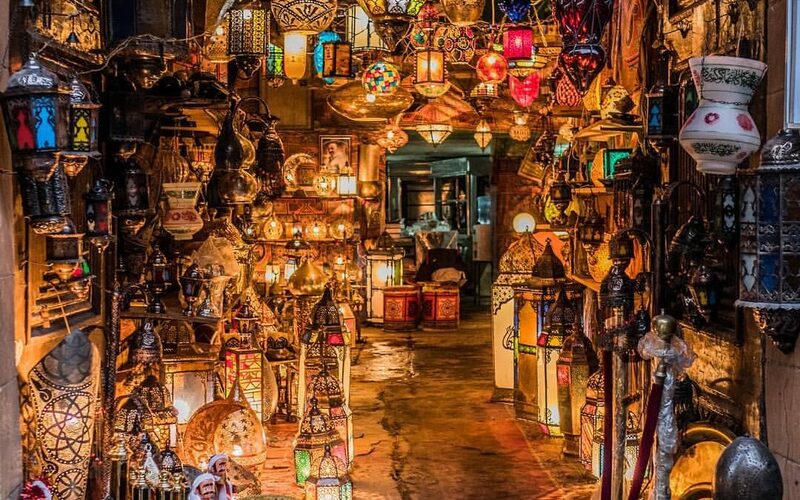 Day 2 – CAIRO TOUR-After enjoying the relish of your breakfast,we would enjoy local sightseeing to Pyramids of Giza and the Egyptian Museum, start your tour by visiting the three Pyramids of Cheops, Chephren and Mykerinus, then move to Panorama area, enjoy fabulous photos for the three Pyramids, next move to the Sphinx, visit the Valley Temple, continue your Tours by visiting the Egyptian museum, it is one of the most famous museums in the world, then transfer to Giza train station to catch the VIP sleeper train to Aswan , overnight in Train. Day 3 – NILE CRUISE-Pick you up from Aswan Station, then you will be escorted to Nile Cruise, check in for Nile Cruise, taste your unforgettable excursions to the High dam, head towards the Unfinished obelisk, Belongs to Isis and Hathor goddesses, Lunch on board your Nile Cruise, Dinner & overnight on board your Nile Cruise. Day 4 – NILE CRUISE- LUXOR-Enjoy your tasty breakfast on board, amuse your eyes while Sailing to Kom Ombo, pay a visit to the Temple shared by Two Gods Sobek and Horus, Sail towards Edfu, head out to visit the Temple of Horus in Edfu, sail towards Esna while tasting your lunch on board, Dinner & overnight on board your Nile Cruise. 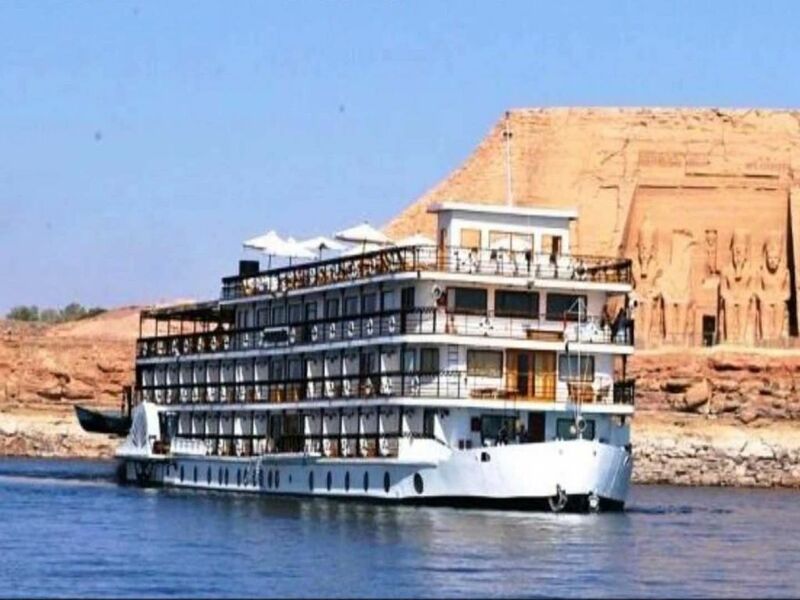 Day 5 – WEST & EAST BANK OF LUXOR -Enjoy your tasty breakfast on board, sail towards Luxor, it’s time to relax, By Afternoon visit the greatest highlights of Luxor, Karnak temple, Dinner & overnight on board your Nile Cruise. 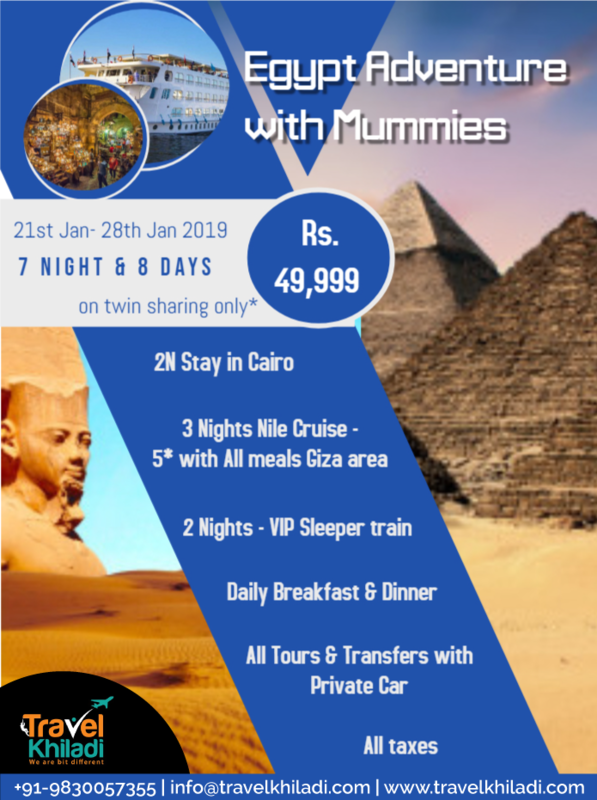 Day 6 – LUXOR- CAIRO- Enjoy your tasty breakfast on board, disembarkation after breakfast, visit Valley of the kings, head out towards the Temple of Queen Hatshepsut, visit the magnificent Colossi of Memnon, tasting your lunch on board, transfer to Luxor VIP sleeper train to Cairo, overnight in Train. Day 7 –ALEXANDRIA TOUR- Arrival at Cairo. Transfer to hotel, later visit Alexandria city located at the Mediterranean Sea by air-conditioned vehicle, where you can taste different culture by visiting Catacomb of Kom El-Shokafa, Qaitbay citadel from outside, and Alexandria library, walk through the magnificent Montazah palace, or try to amuse your eyes by visiting Roman amphitheatre ( If visit is allowed ), manage to relax by having lunch at local restaurant, then drive back to Cairo, overnight in Cairo. Day 8 – TRANSFER TO AIRPORT -Post breakfast transfer to Cairo airport to board your flight. Service of Meet & assistance upon arrival & departure by A/C vehicle. Relevant transfers as per the above mentioned itinerary. Currently applied entrance fees for the above mentioned sightseeing. Professional English speaking tour guide during sightseeing. VISA Charges – we will do this for you - just need to pay visa fees.